I pretty much always have a rotisserie chicken in the fridge, even before the switch to Paleo. It is just too easy to work with during the busy, work week! Plus, I love chicken salad! Since going Paleo, however, I haven’t really had it because, well, what am I going to eat it with? No more bread. No more crackers. Then along came my discovery of Pure Wraps, and I am back in business! This is awesome because chicken salad is a versatile, quick weekday lunch! My chicken salad is different literally every time I make it, and it all depends on what I have on hand. 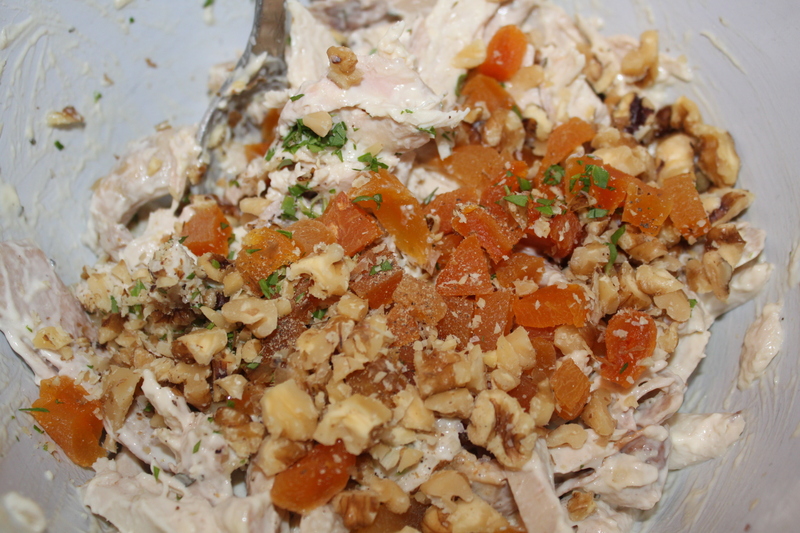 My go-to faves are apricots, walnuts, onion and tarragon, which is what I happened to have on hand tonight. The key for me is the tarragon, or Mexican Mint Marigold. My mom turned me onto this herb a few years ago and it has quickly become one of my favorites, especially in chicken salad! If you don’t have it, you could sub in any herb you have. Rosemary would be nice. Be forewarned….there are no quantities here. If that freaks you out, sorry. You will just have to deal with it because this is a ‘make it how you like it’ kind of recipe. Surely you know how you like it, right? Some people like a lot of mayo, some like a little. Some might like the sweetness of the dried fruit and want to add more, and some might not. It is totally up to you how much of each ingredient you put in. And the beauty of it is…you can’t really mess it up! Personally, I am heavy on the onions and about even on everything else. I LOVE onions! and yes, the hubs still kisses me. He must love me. Sigh. Put it all in a large bowl together and mix it all up. 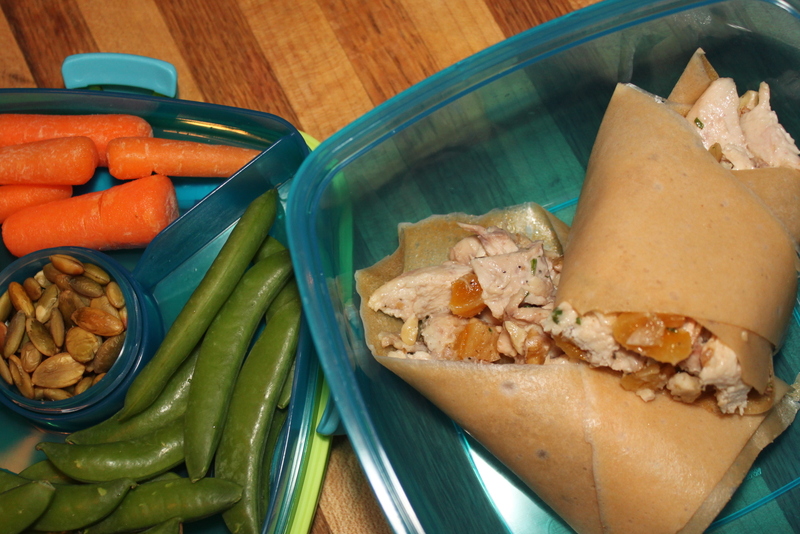 Wrap it up in a Pure Wrap, add some veg and then pack it to go to the office. or the park. or the car. or wherever you enjoy your lunch! It really doesn’t get much easier than that for a busy weekday! This entry was posted in Chicken, Uncategorized and tagged Chicken salad, lunch, Mexican Mint Marigold, Paleo chicken salad, Paleo Mayo, Pure Wraps, tarragon. My favorite ways to have chicken salad is with cubed sweet potatoes and dried cranberries or curried chicken salad.